Cesium is a free, open-source virtual globe platform for web browsers that uses WebGL to create sophisticated 3D maps without a plugin. Cesium uses a geospatial data schema called CZML that can draw building models, lines and polygons overtop of base maps. Cube Cities building data such as floors, outlines, internal building cores and multigeometry shapes can be drawn and distributed using Cesium. Using the Cesium platform Cube Cities building data can now be seen with base map data from Bing Maps, ESRI, OpenStreet Maps and Stamen Design. Learn more about Cesium here. 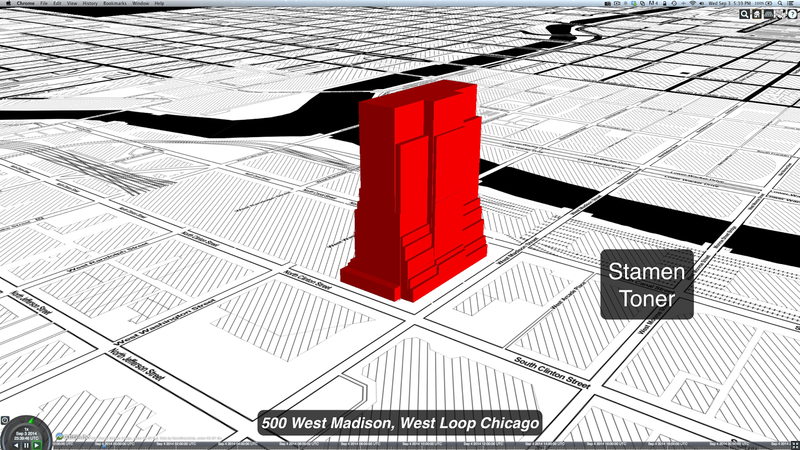 The video below is an example of a Cube Cities multigeometry building model (500 West Madison Street in Chicago's West Loop) drawn in Cesium with a cycled series of open source base maps.